It’s Superbowl Sunday and the annual tradition of having the president give an interview to the network broadcasting the game is one of the few that Trump isn’t scrapping. Never mind that he recently told his press secretary “not to bother” with holding daily press briefings anymore. Trump agreed to sit down with Margaret Brennan of CBS News for a few minutes of lying and casting insults. Among the atrocious outbursts in this interview were Trump’s remarks about what he had learned from negotiating with House Speaker Nancy Pelosi. His unresponsive reply was that she “doesn’t mind human trafficking,” and that “people [are] dying all over the country because of” her. Apparently he learned nothing as he stuck to his routinely hostile behavior of slandering his perceived enemies. But his childish acting out is evidence that he learned what he feels like to get beat to a pulp by a smarter, more experienced political opponent. Trump also made some ludicrous assertions like claiming that the report by special counsel Robert Mueller exonerated him (Mueller has not published any report). And he admitted that stories about Secretary of State Pompeo talking to Mitch McConnell about running the Senate were true just seconds after calling them “fake news.” Then he characterized the fact that much of his cabinet consists of people serving in an “acting” capacity as a good thing because it gives him more flexibility. It also gives the nation a bunch of hacks who have never been vetted or confirmed by the Senate as the law requires. And he said that his indicted pal Roger Stone never worked for his campaign except for the time that he did. HUH? They were asked questions AND answers in this report that wasn’t a report? He went on to provide provably false information about the presence of ISIS in Syria, saying they were ninety-nine percent gone. When Brennan pointed out that Republicans in Congress had just voted to repudiate his positions on abruptly withdrawing from Syria, Trump’s answer reached back to the GOP primary in 2016, where he bragged about beating the Republicans who ran against him. That, of course, had nothing to do with the question. Bush’s intel people told Bush exactly what he told them to say. They didn’t get it wrong. They lied at Bush’s direction. However, Trump is correct that he doesn’t have to agree with this Intel staff. But you have to wonder what the basis is for his disagreement. If he isn’t getting advice from them, from whom is he getting it? 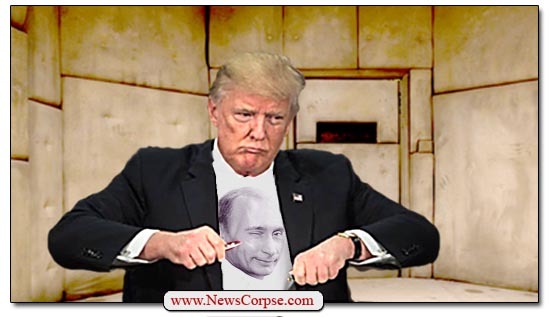 All we know is what he said next: “When my intelligence people tell me how wonderful Iran is – if you don’t mind, I’m going to just go by my own counsel.” So far as anyone can tell, Trump’s counsel is either Vladimir Putin or Fox News – or both. Seriously? Kim is a brutal dictator who murders his foes – even family members – and oppresses his people. But Trump gleefully brags about having “fantastic chemistry” with this tyrant? And this opinion comes long after their summit wherein Kim totally played Trump and has failed to deliver on anything they discussed at the time. In fact, Kim has actually expanded his nuclear facilities and arsenal. The one thing that Kim has that Trump truly envies is the blind adulation of his people. And on that Trump openly expressed his desire for the same sort of cult worship from the American people. He isn’t going to get that. At the moment he is the most unpopular president of all time. And judging from recent events like his government shutdown and the arrest and indictment of his closest associates, that isn’t going to show much improvement any time soon.